This week's space is just a bit of fun: watercolour pencil scribbled on a large white jotter. No reason; no purpose. When life gets a bit crazy* isn't it nice to do a few things just because? Beautiful, even if it was just for fun with no real purpose. Oh wow! That's absolutely gorgeous! ohh I know that decibel erruption!! lovely Liesl and nice just because. I agree, "just because" amidst chaos is magically grounding. And your "just because" is very pretty! Your work is really beautiful. I hope that you continue to play in this medium, and to have fun with it. Missed you last night. Look forward to catching up soon. So pretty - are they hydrangeas? I love them. Wow, you must do great doodling! 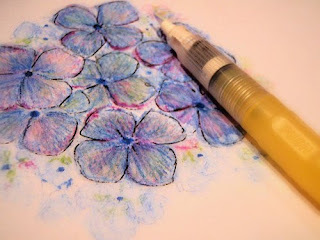 such a pretty scribbling ... it would look pretty as am embroidery ... or perhaps i just love purple too much. That is a lovely little painting Liesl, beautiful subtle blends of pretty colors! Life is crazy sometimes eh! Oof, hydrangeas - you've captured the colour perfectly. There's something about four-petalled flowers that get me excited and these are one of my favourites. Beautiful Liesl - where were you on Thursday NCB?